One of the best views of Longs Peak is from the Moraine Park area of Rocky Mountain National Park. 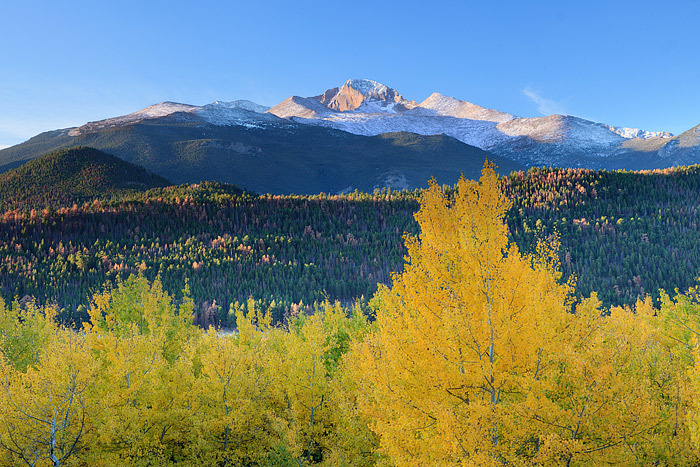 Framed with Aspen trees in their full fall splendor, Longs Peak and The Diamond are coated with early season snow. The seasons in Rocky Mountain National Park are in full transistion and elevations changes play a major role in the conditions present in different areas of the park. Photo © copyright by Thomas Mangan.